The second racial guidebook for Strom Bunny Studios‘ stormpunk setting of Rhûne is 35 pages long, 1 page front cover, 1 page editorial, 1 page ToC, 1 page SRD and 1 page back cover, leaving us with 30 pages of content, so let’s take a look, shall we? Beyond the city-states of Vallinar, where technology reigns and works against (or in favor?) of the impending Ragnarök lies the land of the Ælves – unlike standard elves, in Rhûne, these stalwart warriors have no undying lands, no refuge awaiting them – rather, they have retreated to their home, waging a war against the steady march of stormtech and the progress of technology it entails – essentially, the Ælves are magic luddites, linked to the very lands of Midgard, all too aware of the fact that the deforestation and ticking of the ragnarök clock will sound their death knell as a species, lest they stop the progress perpetuated by the dwarves that already has claimed a significant amount of forests throughout the world. With bow and blade, they fight for their survival – not out of ignorance or conservatism, but out of sheer necessity. Ælves have different racial traits depending on one of the three blessings of primal ælven goddesses: Ælves of Alnara’s Blessing get +2 Dex and Con, -2 Cha, run as a bonus feat and +2 to initiative, do not age within their forests, can pass without a trace at will, are proficient with longbows, longswords, rapiers and shortbows (and the composite equivalents of the bows) and Ælves of a wis-score of 11 or higher may 1/day use create water, detect animals or plants, entangle and know direction as spell-like abilities, get darkvision 60 ft., a +2 dodge bonus to AC and +2 to saves versus enchantments. Ælves of Nayadia’s Blessing get +2 to Dex and Int,-2 Cha, darkvision 60 ft, run as a bonus feat and +2 to initiative, do not age within their forests, can pass without a trace at will, are proficient with longbows, longswords, rapiers and shortbows (and the composite equivalents of the bows), get +2 to Knowledge (planes)-checks, +1 caster level when casting either spells with good or darkness-descriptor (chosen at character creation) and may act in a surprise round even when failing their perception-check, though they still count as flatfooted (I REALLY like that one!) and finally they get weapon finesse as a bonus feat. The final type of Ælves are those of Velluna-Akka’s Blessing: These Ælves get +2 Dex and Wis, -2 to Con, get dakrvision 60 ft., run as a bonus feat and +2 to initiative, do not age within their forests, can pass without a trace at will, are proficient with longbows, longswords, rapiers and shortbows (and the composite equivalents of the bows), get stealth and perception as class skills and may 1/day cast faerie fire, obscuring mist and sanctuary as a spell-like ability. They also cast abjuration and divination spells at +1 level and increase their miss chance in dim light to 50% instead of the usual 20%. They also get resistance 5 versus negative energy, don’t lose hit points when gaining negative levels and save at +2 versus negative energy, energy drain, death effects and spells and spell-like abilities of the necromancy school. The first two Ælven types may be powerful, but this third one is flat out too powerful – with superior spell-like abilities, extremely useful unique abilities, the increased miss-chance in VERY common conditions etc., this race needs a whacking with the nerf-bat to fit even with the other rather powerful Ælves. Basic racial traits out of the way, next up would be the racial class options, first of which would be the Master of the Sil – a spellcasting template more suitable for NPCs since it adds +2 to the CR of the creature and makes it a guardian of a sacred site, imbuing it with power. Trapped by the activation of the Bilröst Gate, the spirits of the perished haunt the outskirts of the ælven realm and those standing against the not necessarily malicious, but still dangerous Darkling Wraiths would be the “Servants of Summer Night” – a 10-level PrC that offers d8, 4+Int skills, full BAB-progression and spellcasting-progression as well as ½ fort-save progression. Beyond martial tricks, these warriors may enchant their blades with properties that help deal with the undying menaces and also learn to channel energy. An ok PrC with nice fluff, but mechanically rather uninspired – have seen that theme done before. Now Rangers may opt for the new shadow stalker archetype, essentially a master of hit-and-run-tactics with access to sneak attack – nice one, though also not too exciting. 5 new feats are also presented in this section, with increased acrobatics-prowess in forests, +2 weavings (more on that later), increased cover from trees, substituting survival for stealth when in the wilderness as well as sharing teamwork feats with animal companions (your animal companion, as a swift action can be treated by you as if having a teamwork feat you possess) offering a couple of nice options. After that, we’re off to the second new culture/race, the Aryandai: Resembling humans with natural skin colorations resembling tattoos and uncommon eye colors, the Aryandai are distinctly inhuman, despite appearances – hatching from eggs and being created as a species to oppose and hunt down the thrall-lords, the Aryandai are natural born hunters. Their racial traits depend on the tribe they belong to: Those of the Night Tribe get +2 Dex and Str, -2 to Wis, climb speed 20 ft., darkvision 60 ft, light sensitivity,+3 to stealth in dim and dark light conditions and also reduce the penalty to run stealthily by 5 and to snipe by 10. Those of the Twilight Walker tribe get -2 to Con, +2 to Wis and Cha, low-light vision, +2 to perception, +2 to saves versus illusions, cast divinations at +1 caster level and may 1/day cast detect magic, undead and poison as well as true strike as spell-like abilities. I’m not wholly comfortable with true strike as an sl sans attribute-requirement and personally, I prefer races to net a bonus to a physical score and a mental one, but that’s a personal preference. The final Aryandai tribe would then be the killing Moon Tribe, who gets +2 Str and Con, -2 Wis, get movement 40 ft, dark vision 60 ft, +4 dodge bonus versus giants and, all of the tribes may opt for an alternate racial trait that allows them to turn into spiders. The Killing Moon feels a bit too focused on becoming the barbarian-tribe for my tastes, but all right. Age, height and Weight-tables are of course, also provided before we check out the first archetype, the Nightspinner: Essentially a ninja with a spider-theme, they are masters of spider venom (with 6 provided) and use weavings instead of ki. The Night Augur, an oracle-archetype has perhaps one of the coolest mechanics I’ve seen in a while: Its powers are tied to the phases of the moon, which comes with a whole page of fluff and names for each and every full moon and new moon of the years as well as a short table to deduce the phase of the moon. While that one is probably not 100% accurate in most settings, I love the blending of fluff and crunch and the sheer amount of detail that supports this crunch – especially since during the new moon, casting actually becomes faster – standard actions turn swift actions, for example – though swift actions remain the pinnacle of speed. Powerful, yes, but also limited, so I’m willing to consider this balanced if handled by a good DM. 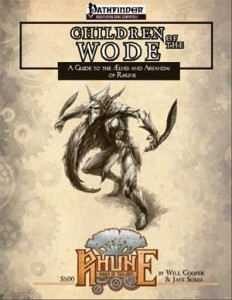 As you can probably glean from my short gushing about the fluff of the moon-phases etc, the fluff spread throughout this pdf is glorious – especially the information on the new organizations like the Black Hand (think Anti-Vallinar foes of civilization), the Greenguard (sworn protectors of ælven interests) or the Green Way- these organizations with faction benefits etc. are well-crafted one and all. The final chapter of the pdf is all about magic and the Great Weaver’s gifts – with the summoner archetype Arachnomancer being only the first of the new options herein: At first, a spider-themed restriction of summoning, a restricted eidolon etc. seem not too exciting – and then things turn interesting: By burning summon monster-spells, archanomancers may heal their eidolons and they also get quite an array of web-themed spells and furthermore, at 4th level, the summoner chooses an aspect that becomes a bloodline-like succession of effects from a selection of 3. Complex, varied and interesting – well done, especially when it could have been just been another lame arachnid-themed caster. If even jaded your truly can still enjoy an archetype like that, it’s a testament to its coolness. Now I mentioned web-themed spells: Poisoned & caustic webs, those affecting incorporeal targets – sounds nice, but not as cool as webjaunts – these spells allow you to not only buff allies, but maintain line of effect and touch range between you and your ally. (Though “Teleportation to a location to a you” should probably read “from a location to a square adjacent to you” for precision’s sake…) The new moon mystery is actually the best take I’ve seen n the subject matter so far and offer some interesting options – from blasting foes with moonbeams to weaving items from moonlight or absorbing light, the mystery is rather versatile.There is also the new Wyrd Domain, which allows you to manipulate fate and the 6 new magic items provided are literally all killer, no filler. Editing and formatting re very good, better than in the first iteration of the predecessor book, but not perfect – here and there some minor glitches have crept in that could lead to incongruence. Layout adheres to Rhûne’s beautiful 2-column standard with gorgeous original pieces of b/w-artworks suffusing the whole pdf. The book also comes excessively bookmarked for your convenience. For all intents and purposes, I shouldn’t like this book – the races per se are a tad bit too strong for my tastes (with one case being broken) and I’ve simply read too many crunchbooks on elves to be easily impressed by…well. Anything. And yes, there are some rough edges to be found throughout the pages of this supplement – but ultimately, at least for me, they fall short of the instances where designers Jaye Sonia and Will Cooper actually dared to opt for uncommon rules-solutions, where one can see that fluff and the concept entwined with these options simply can’t be this easily separated from them. Spider-themed caster? Seen probably too many and still – this pdf delivers one I’d like to try out. The same goes for lunar-themed options – I’ve seen my share of them, but the sheer level of detail and guts involved in the design of these options deserves to be acknowledged. Are the options herein on the upper end of the power-scale? Probably yeah. Can decreased casting time be broken if a DM does not take heed the warnings and becomes sloppy with the tracking of moon phases? Most definitely. Does the pdf deserve to be rated down for it? In my opinion…no. I’d rather have an imperfect, exciting option, a unique ability (or a couple of them!) than a mechanically-polished, but bland one that provides + x spell-like abilities, +2 to saves and a class skill. Now I can’t rate this the full 5 stars, but what I can do is award it 4.5 stars, rounded up to 5 for the purpose of this platform – for excellence in fluff and daring for courageous design decisions.